Private prisons have become an integral part of the penal system in the United States, the United Kingdom, and Australia. There already are over 100 such prisons in these countries, and with the number of prisoners continuing to increase rapidly, the trend toward privatization seems irreversible. 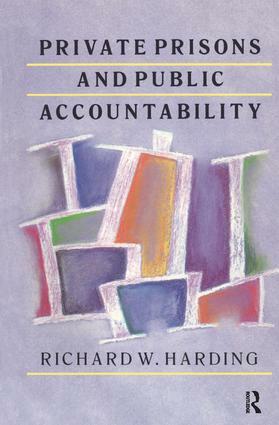 In this context, Richard Harding addresses the following issues: the contributions, positive or negative, that private prisons make to providing custody for offenders; whether or not private prisons stimulate improvement within the public prison system; and the difficulties with the regulation and accountability of private prisons.This book sets out to explore the contribution of private prisons to custodial practices, standards, and objectives. Many experts believe that, properly regulated and fully accountable, private prisons could lead to improvement within the public prison system, which has long been degenerate and demoralized. Harding sees the total prison system as a single entity, with two components: public and private. He relies upon extensive fieldwork and draws upon published literature as well as in-house documentation, discussions with public and private authorities, and a range of government documents.Key issues covered in Private Prisons and Public Accountability are: overcrowding, program delivery, prisoners' rights, quality of staff, and financial control. This volume will be a significant addition to the criminal justice literature, but it will also appeal to sociologists, policymakers, and scholars interested in the privatization of various institutions in our society.